It's a cool and rainy day here in the Lou. Just the kind of day to crack open the windows and bake a pie. The children sneak outside and squeal in delight as they ride their bikes up and down the streets splashing through the fresh puddles. The sun threatens to peek out from behind a cloud and the birds take advantage of the little bit of warmth to dry their wings. Meanwhile, I'm snuggled up inside taking in the warm scents of the blueberries and cherries blended together in a flaky pie crust. Looking forward to spending the afternoon with good friends and wine. Pondering the thought that fall is so near yet so far away. Heat oven to 425. Place cookie sheet on oven rack. In medium bowl, stir together pie filling, cherries, and flour. Spoon into pie crust. In small bowl, stir together flour, brown sugar, coconut, and butter until crumbly. Sprinkle over filling. Bake on cookie sheet 35 to 45 minutes or until filling is bubbly. Welcome back my friend! I will be right over for my slice! This post actually makes me excited for fall even though I am really enjoying summer. I love having things to look forward to. Have a great week, Dee! 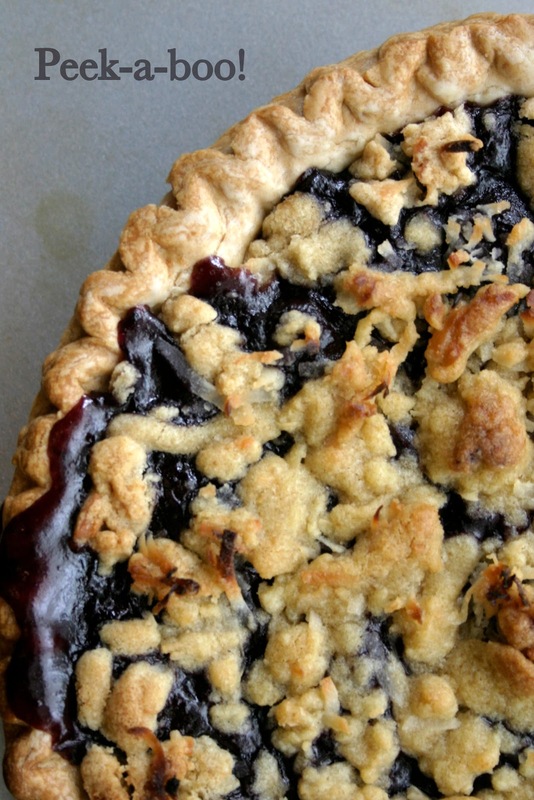 I've never baked blueberries and cherries together but this pie looks amazing! I bet once the kids got a whiff of the delicious pie, they came running! What a great combination and gooey ooey pie! Send some of that rain my way would you? The pie looks good, it must be very sweet. ahh snuggling up and smelling this delicious pie sounds wonderful. this looks great! Lovely looking pie. Thanks for the recipe to try this afternoon. Been craving some pie, and blueberries are always a winner in my kitchen. job and was struggling to make her payments by the due date, which soon snowballed to about $10,000, which she just couldn't afford to pay for, given her grim financial circumstances. date, which soon snowballed to about $10,000, which she just couldn't afford to pay for, given her grim financial circumstances. of HGH that replenishes those levels in a very efficient way. human growth hormone can slowdown or even stop aging. ' Keeps Your Heart Healthy - Healthy HGH levels have a positive correlation with an increase in good cholesterol and a decrease in bad cholesterol in scientific studies. This is a topic that is close to my heart..
. Take care! Where are your contact details though? Before long you will notice that your hands remain soft and silky all the time. It does work, but I still treat myself to manicures to ensure that my hands always look good. perhaps you can keep them in your pockets or consider wearing gloves. This is actually, the main gen fx is specific to the trio reward Organisation. you wedge to it and use a proper Put up round therapy subprogram.